Although well-regarded amongst New York’s dance fraternity, Pilates was unknown in the UK at that time and Alan returned in 1970 to set up Britain’s first-ever Pilates studio. Among his first clients were actors, dancers and singers, but word soon spread as doctors and physiotherapists began recommending Pilates to patients struggling with chronic injuries. Alan now lectures on Pilates around the world, and he has written several successful books, including The Pilates Directory (2004), The Gaia Busy Person’s Guide to Pilates (2003), Pilates for Men (2007) and The Complete Pilates Tutor (2014). 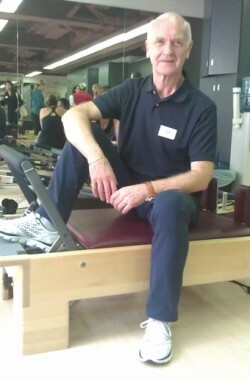 He runs a training course for Pilates instructors in London and supervises courses in both Athens and Istanbul. As well as running his own studios, he and his assistants teach in dance schools and designated Pilates studios internationally. Alan is the Chair of Pilates Method Alliance UK Chapter, designed to foster professional interaction and continuing education opportunities for Pilates professionals. He is invited each year to present at the PMA Conference, as well as Balanced Body’s international Pilates On Tour. Dentistry is very bad for your back because the way you have to sit creates tension and I was always in pain at the end of the day. Since I started doing Pilates four or five years ago, I sit with better posture, and have much less tension in my muscles.